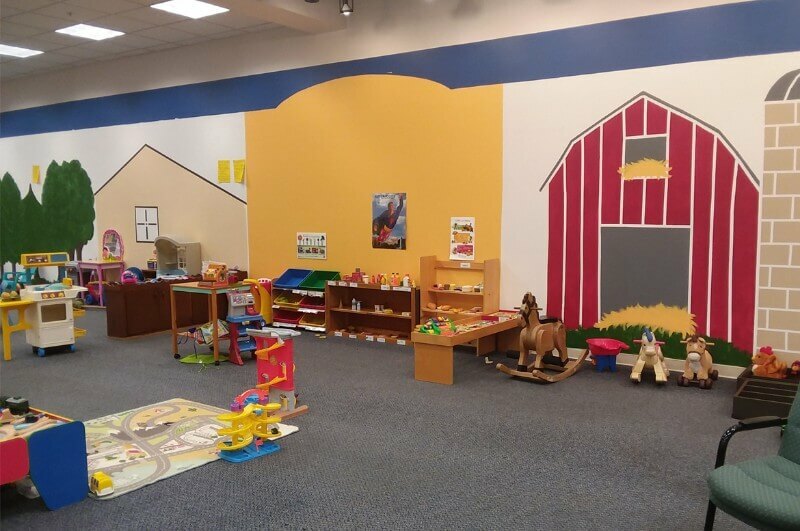 The North Iowa Children’s Discovery Center provides a safe indoor place for families with younger children (ages 0-10) to play, learn, and grow together in a kid-sized interactive play village. The interactive village emphasizes creative play and allows you and your child to explore a farm, grocery store, home, campground, stage/theater, clinic, fix-it shop, and school. The Discovery Center also offers free-play activity stations such as art, musical instruments, nature/STEM, and train tables. Many exhibits offer a learning connection to encourage visiting other North Iowa cultural attractions. There’s enough room for young children to explore freely, including a variety of ride-on toys. Enjoy stroller parking for easy downtown exploration, and easy access to restrooms, diaper changing areas, and an international food court nearby. Admission is good for all-day play, so your family can head for lunch or other breaks when needed and return later. The North Iowa Children’s Discovery Center is the perfect option for families with younger children who come to town for job interviews, appointments, conferences, events, and family gatherings. If your family has several young children, consider us for your next family reunion or gathering! Wednesday, Friday & Saturday: 9:30am-4:30pm; large group reservations available 7 days a week, closed holidays. Suggested Donation: Ages 1-4 $1.00 per year of age; Ages 5-Adult $5.00; Babies are FREE!